Imagine pulling up outside a petrol station and being able to instantly download an HD movie in less time than it takes to fill the car with fuel. Or at home, wirelessly connecting together your TV, tablet, PC and mobile phone and being able to shunt around huge amounts of data between them without long waits. A California laboratory has been testing a new technology that promises to turn these scenarios into reality. It is called Wireless Gigabit - and the Santa Clara lab recently put so-called WiGig devices through their paces to check they were interoperable. "The event was very successful. Participant companies were excited about their implementation of the WiGig specifications," Dr Ali Sadri, president of the Wireless Gigabit Alliance, told the BBC. It is another step along the road for the high-speed wireless standard which was created in May 2009. It operates in the unlicensed 60GHz spectrum band, which has little interference, meaning it can offer speeds far higher than traditional wi-fi - up to 7Gbps (gigabits per second). Last year it was ratified by the Institute of Electrical and Electronic Engineers (IEEE). "This is a revolution in communication. It offers tools that customers never had before," Dr Sadri told the BBC. "It is a game-changer in wireless and in a couple of years who knows how many new applications there will be for it," he added. That promise has helped attract several high profile backers including Intel, Microsoft, Cisco and Nokia. The speeds offered by WiGig mean it can shift data in a way that wi-fi can only dream of. "Wi-fi networks are very busy and over-crowded and cannot deal with bandwidth-heavy applications," said Carlos Cordeiro, a senior member of the IEEE. However, there is has one major drawback. WiGig's range is limited to between 10 to 15 metres - a factor that may prevent it being crowned the next-generation wireless standard. "Its much shorter range means it isn't so much a replacement for wi-fi as for cable," said Mark Hung, an analyst with research firm Gartner. Even so, the appeal of a cable-free future is obvious. Our desire for fast data downloads has caused countless living room corners to resemble spaghetti wire junctions. As devices continue to swap more data, more often with a rising number of other products, there is a growing need for faster wireless transfers. Image caption Can devices get any thinner? "Interconnectivity of devices in the home will be the key to utilising the ever faster connections we can get... people want easy ways of getting HD video from their camcorder onto their TV, and also onto their tablets," said Andrew Ferguson, co-founder of broadband news site ThinkBroadband. Another reason to want a cable-free future is the desire for ever thinner devices. When Steve Jobs pulled the new Macbook Air from a manila envelope in 2008 it seemed as if devices could not get much thinner. Manufacturers have since competed to shave further millimetres off their laptops, but their need to build in power and cable ports has proved to be a constraining factor. "To make devices look sexier the industry is keen to get rid of all connectors. 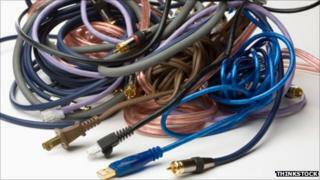 Currently the thinness is limited only by the need to have these connectors," Mr Cordeiro said. In the future ultra-thin port-free devices may become the standard. "In terms of power there are wireless solutions already available," said Mr Cordeiro. WiGig is not the only wireless standard offering high-speed data transfers between devices. Ultra-wideband is also designed to carry large amounts of bandwidth over short distances. But so far it has failed to catch on. "There are no standards for it and the industry has not really adopted it," said Mr Cordeiro. Dr Sadri believes that the standard could become a commercial reality by the end of 2012. But that does not mean you can throw away all your cables just yet. "The adoption curve will be slower than for wi-fi because it will rely on a whole ecosystem, and that will take a while to put in place," said Mr Hung. "At first we will see it in laptops and PCs and the peripherals that connect to them."